I love this scarf! I think I have two little girls here who NEED one for Christmas! I love this scarf. I am making it for someone for Christmas for sure. I think I’ll just make it and give it to someone! Lovely pattern! I LOVE your blog! I have added you to my blog roll too. Have a great day! Hey, thanks for the comment and for adding me to your blogroll. I’l have to try some of your patterns! And SNAP! Matching profiles, lol. Beautiful scarf! I’m going to have to make one! Thank you for sharing your pattern with the public! 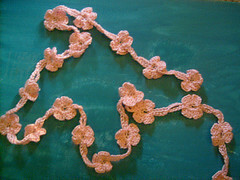 I am looking for the perfect embellishment on a little baby girl’s crochet( thread) dress. I think this will be just the thing in a thin thread. Very pretty and I’ve been experimenting with something similar. Thanks so much for sharing, I can’t wait to try it in different colors. I only learned how to crochet about a week ago, but I got tired of back and forth rows and rows of scarves pretty quickly… this was certainly a challenge, and I had to learn some new stitches and tear out a lot of work! But in the end it was worth it… this scarf came out so cute (not anywhere as nice as yours looks in the picture, but I’m satisfied with my first try), and it didn’t take long at all :3 Thanks so much for the pattern and the opportunity to expand my crochet knowledge! Your site is so much fun, and I think I will be trying out more patterns in the future. Thanks so much for sharing your pattern with us. I have a similar pattern for a triangle shawl, but your pattern is a COOL and fast gift idea. I’ve been looking the web for my research on this topic. I’m so grateful what you shared brings a new attribute to the data I’m compiling. I truly appreciate the way which you look at this topic, it provide me a another way of looking at it now. Thanks for the share. Thanks SO MUCH for this pattern, fellow Nathalie/Natalee!!! I found it on Ravelry and it’s *just* the thing for gift-giving. It’s coming together so quickly, I bet I’ll be able to churn out several in the next month or so!